The heavy nuclear missile cruiser "Admiral Nakhimov" in the Barents Sea. Project 1144, to reconstruct the ‘Admiral Nakhimov’ the world’s largest missile cruiser, is taking place in northern Russia, at the country’s only docking facility for building atomic submarine cruisers. After the upgrade, it will replace the Pyotr Velikiy, another cruiser which will also undergo a refit, as the navy’s flagship. 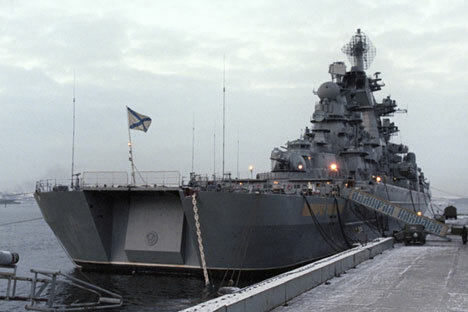 According to Vladimir Spiridopulo, the cruiser’s design engineer, the upgraded Admiral Nakhimov will be the Russian Navy’s most powerful ship. It will be equipped with Tsirkon hypersonic missiles. A crucial stage in the production, involving removal of old equipment from the cruiser, has been completed, Sevmash told RIR. Preparations are on for the refit. The abrasive cleaning of the hull will be complete by the year end. The hull structure has been repaired; cutouts have been made at the location of the Granit cruise missile launchers, to allow installation of the new ‘Kalibr’ missile launcher unit. According to reent official information, after the work is complete, the cruiser will carry 80 cruise missiles and 96 anti-aircraft missiles with S-400 anti-aircraft systems.The Pantsir anti-aircraft artillery unit will be the last line of defence of the anti-aircraft defence system. The ship will be equipped with Paket NK, a new torpedo unit. All radio-electronic equipment will be completely replaced. The previously installed Granit hypersonic anti-ship missiles on the Nakhimov were only able to attack surface targets. After installation of the new ‘Kalibrs’ the cruiser will be able to attack both surface and underwater targets. In terms of the weaponry and radioelectronic equipment, this will be a completely new ship with significantly enhanced combat abilities. The plan is to install hypersonic missiles on the Admiral Nakhimov, to make the ship practically invincible. At the end of October Sevmash signed a contract with Almaz-Antey, manufacturers of the anti-aircraft defence system, for manufacture and delivery of ten ЗС-14-11442М universal vertical missile launchers for the Admiral Nakhimov atomic missile cruiser. The launchers will be modified to accommodate the following missile units: 3К-14 (Kalibr), 9К, 3М55 (Onyx), 3К-22 (Tsirkon). The prototype is expected to be tested by August 2016. The ‘Tsirkon’ hypersonic missile is one of today’s most secret designs of the United Instrument Manufacturing Corporation. According to Dmitri Kornev, executive editor of the specialized web portal MilitaryRussia, ‘Tsirkon’ is a multi-service missile unit with a hypersonic missile. There has been unconfirmed speculation that the BrahMos-II anti-ship missile was the export version of the ‘Tsirkon.’ All tactical specifications of the missile are classified, but the ‘Tsirkon’ can likely reach a velocity of no less than 4.5 Mach. According to sources, the missile was ready for testing in 2015 but, based on client requirements, the prototype is likely to be tested by August 2016. Orlan project 1142 involved building four cruisers: Admiral Ushakov (known as Kirov in the USSR), Admiral Lazarev (known as Frunze in the USSR), Admiral Nakhimov (known as Kalinin in the USSR) and Pyotr Velikiy. The first three ships were used for a short time. After the Soviet Union broke up, they were left standing at the berths waiting for repair or utilization. Some years ago Russia’s Ministry of Defence decided to modernize the cruisers. After ‘Admiral Nakhimov’, modernization will also include the Pacific navy’s ‘Admiral Lazarev’, now in a ship-repair yard. During Soviet times, the modernized ships of Orlan project 1144 (including Admiral Nakhimov) were the offensive power of the supermarine group of ships, whose objective was to deliver devastating blows to the supermarine enemy forces. In peace time, the Orlans patrolled the ocean on the lookout for potential enemy ships.